Recently at the launch of the Colombo District Strategic City Development Plan – Taking the Farsighted Vision of Sri Lanka’s Capital City towards the 21st Century - at Temple Trees, a powerful message was sent to Sri Lankans. Megapolis and Western Development Minister Patali Champika Ranawaka spoke to the media that evening about the plans for change the government has in store for Sri Lanka. A crucial part of the message was about the Port City. The evening kicked off with an introduction to the Port City, followed by Minister Ranawaka’s address. Sri Lanka, the Pearl of the Indian Ocean, is the key link between the East and West and offers access to a thriving region of accelerated growth. The Port City spans 2,069 hectares. A large city where people can work, live and play. * have a luxury marina and a theme park which will make it a top tourist destination. “Our greatest strength is our global positioning. When it comes to trade and commerce, the Indian Ocean is a critical region of water. It is an important place identified by many scholars. And Sri Lanka is in the very middle. It is an economic centre. As Sri Lankans, we need to capitalise on this. In the past, we held an important position in trade, and in the present and future, this will be the key. We must not miss this opportunity. Foreigners will visit the Port City, and it will bring in wealth to our country,” Minister Ranawaka said. “Today, when it comes to developing Sri Lanka, there is much discourse and sharing of opinions. We all want to hear favourable news about our country. However, the unfortunate thing is that all we hear is about the negative side of the country. When I went to Singapore in 2018, I saw many things of interest to me and my ministry. When I came back to Sri Lanka, I inquired from an economist how much income we have generated from tourism in 2018. From the statistics I obtained, I found that the expenditure for sending people abroad was US$ 1,100 million. The income generated from tourism was US$ 3,900 million. From this I understood that 40 percent of our tourism income is utilised to send people abroad,” the Minister said. “One huge problem in Sri Lanka is the brain drain. This can be for many reasons, but one predominant reason is the search for greener pastures and better jobs abroad. This is particularly true in the case of doctors and engineers who have received their degrees and left Sri Lanka for better jobs. There is a significant representation of this category in Australia, the United Kingdom, the US and Canada. Sri Lanka is in debt and has corruption. So we are involved in discourses that leave a question mark when it comes to the development of our country. Is there anything positive we can take out of this?” said Minister Ranawaka. However, he stated that we must not despair because there are many fields in Sri Lanka that have capable and efficient people. The health sector is one of these fields. Here we see a definite improvement in the life expectancy of Sri Lankans. At the time of Independence, life expectancy was 55 years. Now it is 70 years. Compared with other countries in the region, we are very much in the lead. There is a similar life expectancy in the USA. “If you take Sri Lanka, when it comes to eco-diversity, we hold a special place. One huge problem the world faces is the increase in global warming. If you take carbon emissions, Sri Lanka is the country that has reduced its carbon footprint admirably. Sri Lanka is a middle-income country and in that category, we have reduced our carbon footprint and become one of the most successful countries in doing that,” Minister Ranawaka said. “We have regressed when it comes to economics. If you take our per capita income, it is in the US$ 4,000 range. Singapore, South Korea, China and Malaysia have surpassed us,” he said. “If we take our per capita debt in 1959, it is has increased 77 times today. With the per capita income increases, the per capita debt has doubled or tripled. This is especially true during the last few years. We are in serious debt to other countries which we need to pay back soon, and we have to pay it off at massive interest rates. By incurring huge amounts of commercial debts and investing them in unproductive ventures, we are in serious debt to other countries. Even this year, the Finance Minister has to pay US$ 5,600 million for debt servicing. Right now we have paid off US$ 1,400 million. If you take the total expenditure incurred to build the Norochcholai power plant, Hambantota Port and Port City, a similar amount needs to be paid this year as foreign debt. We need to learn from a country like Argentina that failed economically. Now Sri Lanka has to face the music and save itself from a disastrous situation,” said the Minister. “In 1998, we moved from the status of a poor country to a low-income earning country. That was over 20 years ago. With great difficulty we have moved beyond the range of a low-income earning country. When will we become a high-income earning country? If we continue as we have been doing during the last few years, it may take us over 40 years. In 1960, the per capita income in South Korea was US$ 158, Taiwan – US$ 150, and Sri Lanka - US$ 142. Now the per capita income of South Korea is US$ 36,000. Taiwan stands at US$ 24,000, Singapore is beyond US$ 52,000, while Sri Lanka is in the US$ 4,000 range. When do we enter the high income earning range? Why can we not succeed in the field of economics as we have done in the health sector and the education sector?” said Minister Ranawaka. “We were in the age of information technology (1960 – 2010). This involves satellites and the internet. We are now in the Smart Age (from 2010). And it is a revolution with the appearance of nano-technology and other technologies such as artificial intelligence and robotics. Do you know that in 2019, during a minute on the internet, 188 million emails are sent? There are 303.8 million Google searches on the internet in a minute in 2019. On Facebook, there are one million Facebook users in a minute. On Youtube, in one minute there are 4.5 million viewers. This is the reality. We can now do all of this on a smartphone,” said Minister Ranawaka. He said that in the past there were no Pick Me taxis. We did not have the banking services that we have now. In the past, there was no Amazon or Ali Baba, Netflix or Instagram. Facebook is a social media site without an editor with 2.2 billion users! Youtube has now to a great extent replaced Sri Lankan television. Today, Facebook is one of the four big technology companies along with Amazon, Apple and Google. “To take a country forward you need peace. If there is conflict and war, the country cannot develop economically. If you take Sri Lanka, we have a lot going for us. Our law is implemented and is in action. We have an independent and efficient judiciary. We have sound financial policies and most importantly, our physical infrastructure is good – we have a good water supply, a good transport system and an excellent health and education sector. We have a good communication system. What we really need now is a city built upon an organised and futuristic architectural plan,” he said. He said that there should be freedom of the press, human rights must be protected and we should ensure that we conserve our environment. That should be our ambition. By 2050, Sri Lanka should be urbanised with all facilities and comforts. The idea is that atleast 80 percent of Sri Lanka should be urbanised. The Minister said that the brightest minds are involved in this attempt to develop Sri Lanka. “We have a lot in store for the people of Sri Lanka - we are completely revamping the environs around the Beira Lake, turning it into a world-class destination. We have in mind a city near the beach and we have in mind a techno city, as well as two industrial zones and two tourist zones. We are thinking of a forest city and a plantation city. We are also thinking about an efficient system of garbage disposal,” said Minister Ranawaka. He also added that there are development plans for Galle, Kandy, Kurunegala, Dambulla, Trincomalee and Ratnapura, Anuradhapura and Jaffna that are being designed with foreign assistance. “We need to change the mentality of Sri Lankans. The mentality needs to be far-thinking and there should be a great passion for change and development. Very soon we will see sweeping changes in the transport sector taking it to international standards. We are now looking at launching the first nano-satellite in Sri Lanka this month. We are trying to foster a culture of research in this country. There are plans for an international-standard incubation centre in the country. In Colombo, we have successfully eliminated most of the slums. We have provided slum dwellers with housing and improved the quality of their lives. 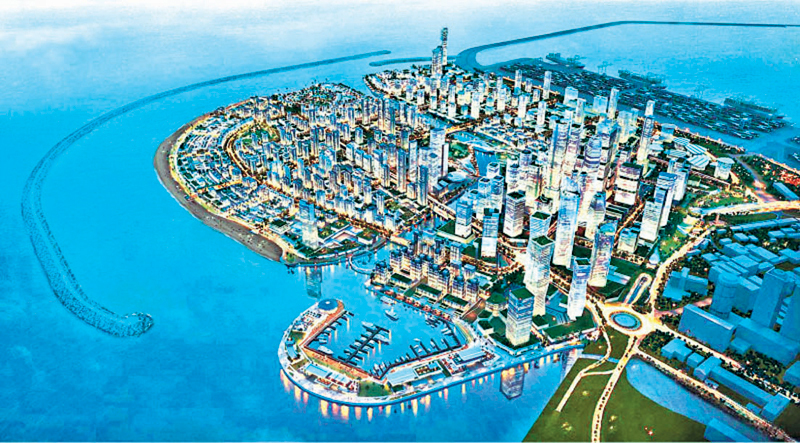 So around Beira Lake, we are developing the city as well,” said Minister Ranawaka. “Large-scale industries are coming up with the Logistics City. With Rs. 23 billion from the profit of the UDA, we are building four complexes.